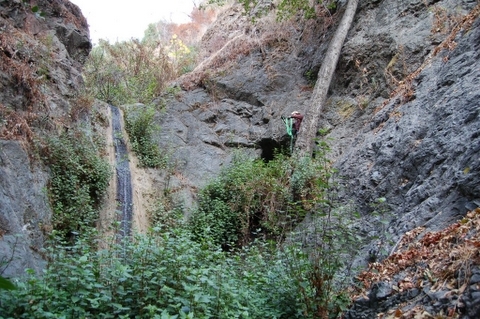 Off and on from 1881 to 1934 hard rock silver mining was performed on the west slope of San Gabriel Canyon beneath Silver Mountain four miles up San Gabriel Canyon Road above Azusa just past Morris Dam. The main mine was worked under several names but today is best known as the Kelsey. At milepost 19.42 gated forest service road 2N28 (Silver Fish Road) which shortly turns into a trail meanders in a northwesterly direction for several miles and soon overlooks nearby Water Canyon where the mine is located. A 5-stamp mill was erected and another mine, the Victoria, was dug nearby. The ore was conveyed to a mill by a system of ore chutes. Both the stamp mill and mine are now beneath the waters of Morris Reservoir. 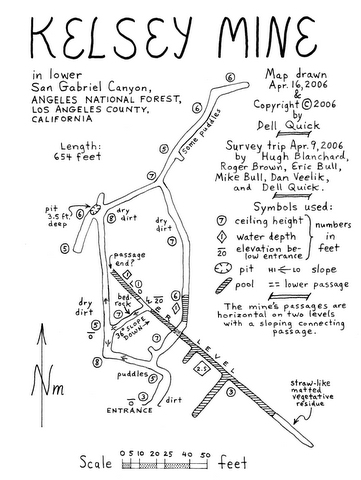 Details of the mining operation and history can be found in John W. Robinson’s hard cover book “The San Gabriels”. 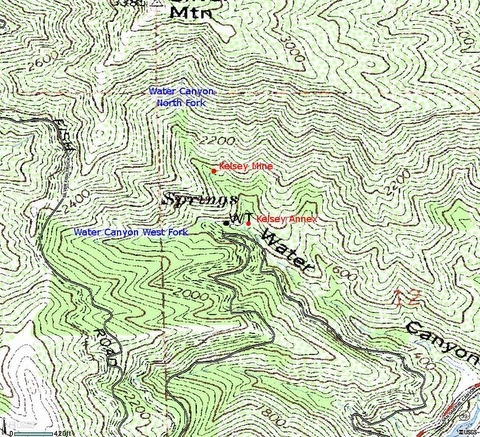 The route to Water Canyon begins at a parking area just before milepost 19.75. Several years ago the writer went up Water Canyon following a heavily overgrown use trail. 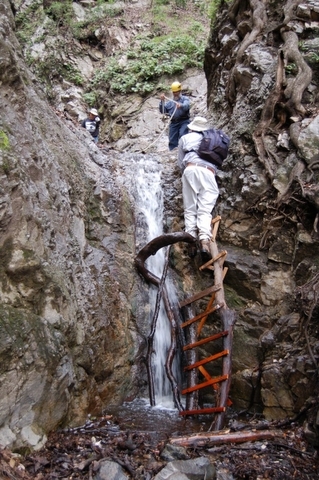 The main obstacle proved to be several waterfalls. After about two thirds of a mile I located a mine on a short side canyon. 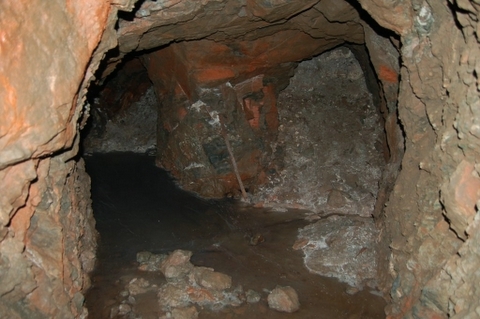 The mine only went in about a hundred feet and contained a foot and a half of water. It ended at a junction with both junction passages clogged after several feet. 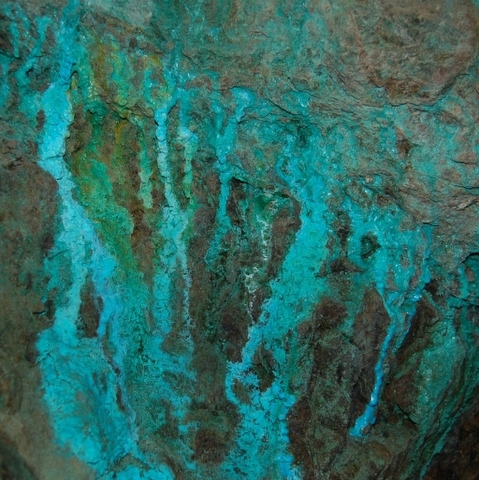 This conflicted with reports from more than 30 years before that the main mine was largely dry, continued in a loop for several hundred feet and contained stalactites and flowstone. In November 2006 Eric and Mike Bull explored the Kelsey Annex, took pictures of its interior and established the relationship of the Kelsey and Kelsey Annex on the topo above. Presumably this completes the exploration of this area unless additional mines are located. 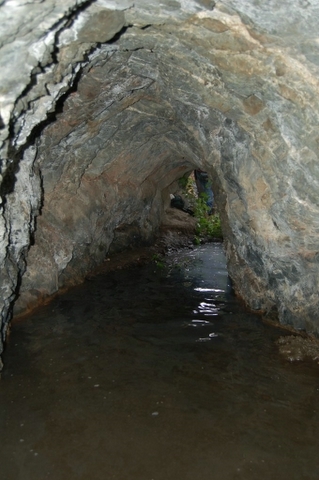 In April 2006 the writer accompanied by grotto members Dell Quick, Eric and Mike Bull, Roger Brown and Daniel Veelik proceeded up Silver Fish Road for a mile and a half to a spot where the road takes a sharp left turn and where a metal water tank can be spotted just across the stream. The water tank replaced an earlier wooden tank and is the only above ground remnant of the Kelsey Mine. All other buildings were destroyed by the 1957 Morris Fire which left only scattered pieces of metal including an old boiler. At this point we climbed down to a side branch of Water Canyon and went downstream around two hundred feet trying to avoid the numerous clusters of poison oak while seeking the main branch of Water Canyon. Upon reaching the main branch we went upstream about 600 feet. This involved climbing over four falls in which rope was quite helpful. On the way we noticed a small dam undoubtedly used for mining operations. Just beyond the last fall we saw a conspicuous mine entrance up on the canyon bank. 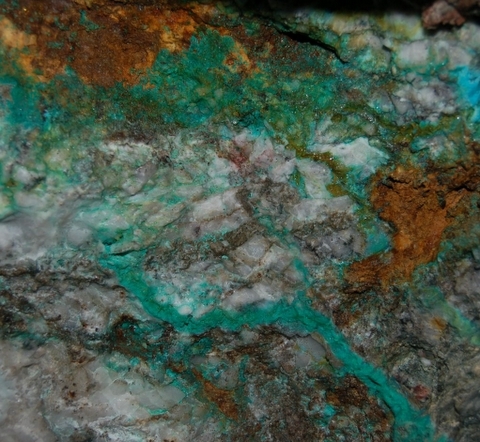 This proved to be the main Kelsey Mine as it fits the description of the mine seen more than 30 years before. We surveyed it at 654 feet including a wet lower level and it contains some small stalactites and flowstone. 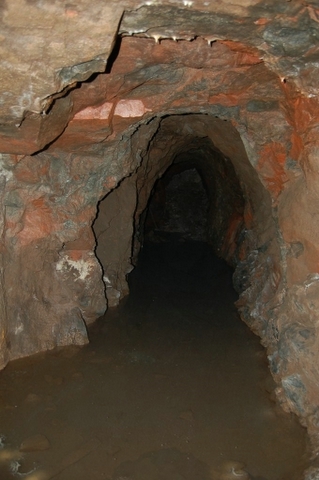 Close to the mine are three exploratory digs none longer than 30 feet. 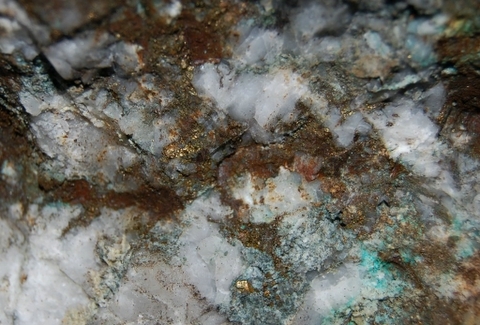 The smaller mine found several years before we dubbed the “Kelsey Annex”. Years ago there were easy trails leading directly to the mines but unfortunately all signs of these old trails have now disappeared. 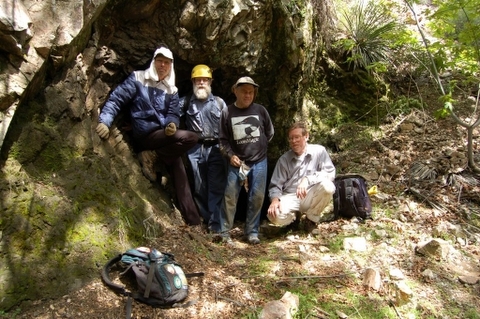 Much credit goes to the Bull Brothers for their numerous photos and to Eric for being the first to locate the mine. Kudos also to Roger and Daniel who provided the rope and assistance in getting over the falls. Finally appreciation to Dell who did his usual fine job in surveying and mapping the mine.